The Shedd Aquarium has a fun series called Asleep with the Fishes which lets you spend the night in the Shedd. 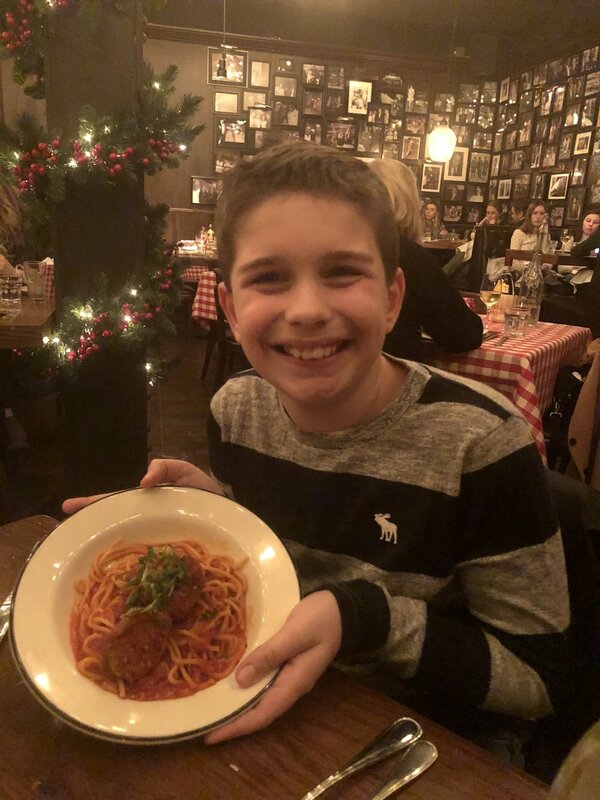 We were excited to be invited to check it out and have all the deets on how to make this a memorable night at one of our favorite Chicago spots! You don’t HAVE to spend the night. While the intention of Asleep with the Fishes is to actually sleep with the fishes and wake up in the aquarium the next day, there is also an option to stay until lights out at 11pm. This is actually what worked best for us because we had plans early the next morning. Staying until lights out is still a ton of fun and would be perfect if your kids have a difficult time sleeping away from home or if the thought of sleeping on an air mattress is too much for your back to handle. This is the Shedd how you’ve never experienced it before. 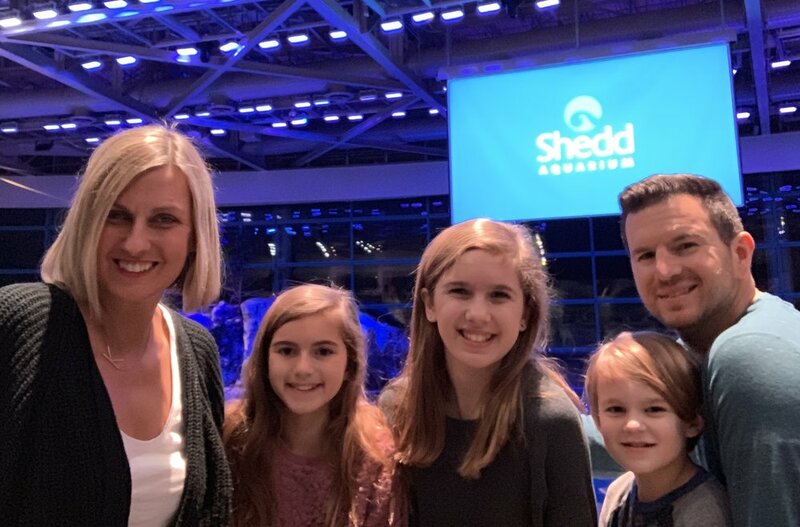 Our family has done Jazzin’ At The Shedd for the last few summers and that is a super fun night. But Asleep with the Fishes is totally different. Jazzin’ At The Shedd is busy and bustling with a mix of families and professionals coming over to unwind after a day of work. Asleep with the Fishes is all families - in fact you MUST have a child with you to attend. 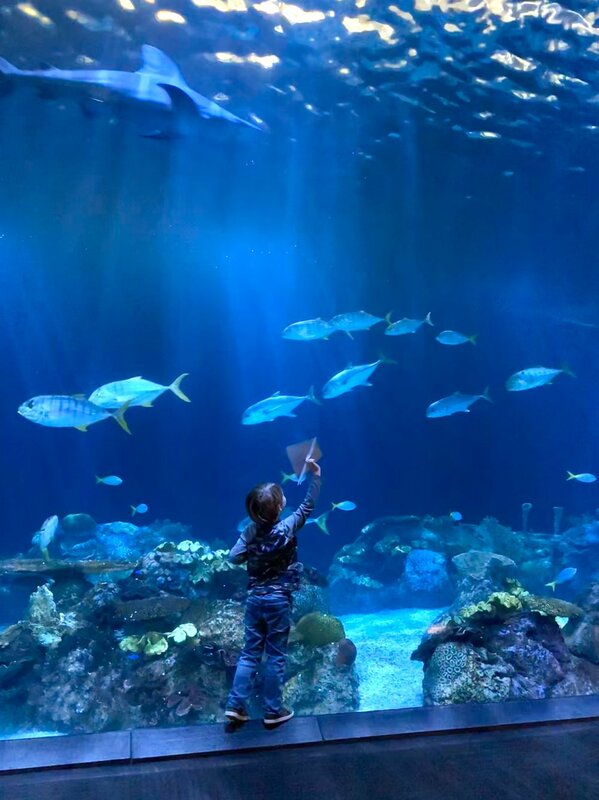 Asleep with the Fishes has a very limited availability so it is basically like having the Shedd to yourself. The photos you will get are ah-mazing. Has your child ever had the yellow submarine to themselves? Yeah, this was the first time for mine, too! Also, there is little to no wait for the different hands on experiences scattered throughout the aquarium. And almost everyone gets a front row seat for the aquatics show in the Oceanarium. Each event has a different theme. The theme for our night was Aquaman! There were photo opportunities and other fun activities that tied into our theme. The night is jampmpacked with family fun. From a scavenger hunt to 4D movies, there is not one moment that isn’t packed with fun. There is even a special feeding to watch and a late night dance party. Can you guess the last song that was played? Baby Shark, of course! It’s bedtime for the animals, too. Our family learned we love to see all of the animals at the Shedd whether they are awake or asleep! Observing the animals at night gave us an entirely new look into their lives. 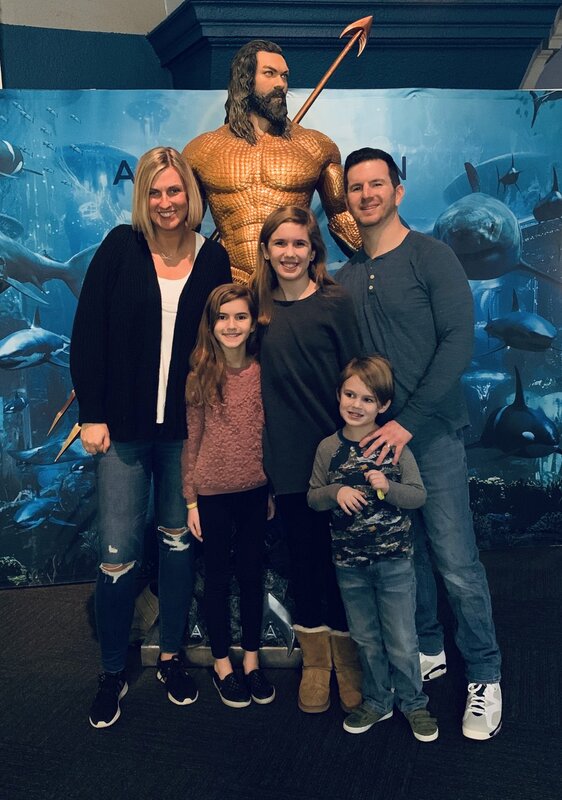 Asleep with the Fishes is one of our favorite family events we have ever experienced. It was great for everyone in our family - the four year old, nine year old and twelve year old, even the grownups! Thanks again to the Shedd Aquarium for hosting us! All opinions are honest and our own. 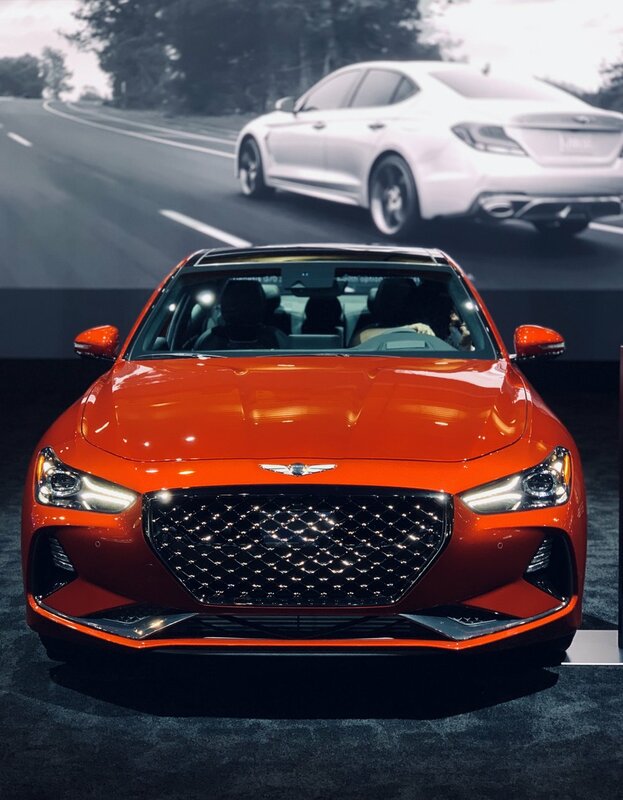 The Chicago Auto Show - the largest Auto Show in the country - is happening now and I partnered with A Girls Guide to Cars for the “What Drives Her” luncheon. This is the third year for the What Drives Her luncheon at the ChicagoAuto Show and its an afternoon to be inspired and network with other women in business and media. Industry leaders like Jessica Petty from Hyundai, Jeneen Rippey from ZF, Edie Wines from National Automobile Dealers Association and Tania Wingfield from BorgWarner (all pictured below). Their advice on careers in the automotive industry was so interesting. These women were pioneers and gave great advice on making your mark in male dominated industries. #SeeHer is an initiative about how we seen women from the Association of National Advertisers. It is important to show women in powerful positions in media because only when we see her can we be her. To learn how you can get involved with #SeeHer, visit seeher.com. It’s amazing the advertisers, television shows and networks that have come together for this amazing cause! Champion yourself but realize working on a team is not a individual sport. Be confident in yourself, and always take the time to reset. There is going to be a work-life balance ebb and flow, that’s okay. Plan for it. The world will revolve without you. Repeat, the world will revolve without you. Sometimes circumstances happen out of your control but the projects will continue with you absent. There was so much knowledge to gain sitting with this group of incredible women, but what I will take away most is new friends and the feeling of being uplifted by those around me. Thanks so much to A Girls Guide to Cars for hosting me at this event and sponsoring this post. 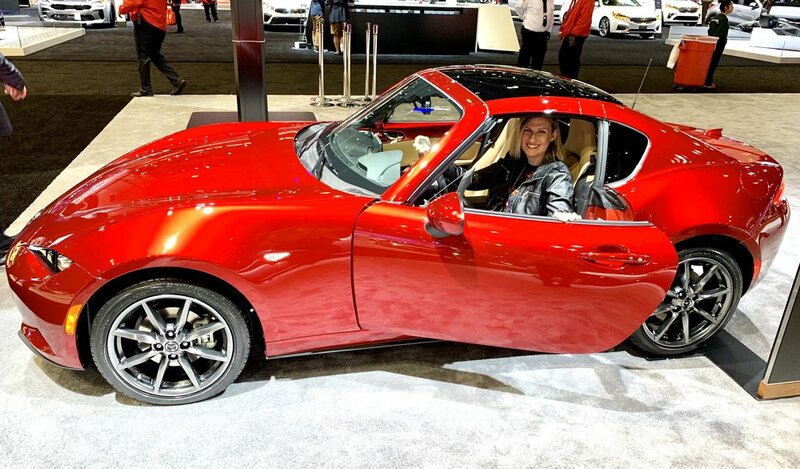 The Chicago Auto Show is happening now at McCormick Place until Monday, February 18th. This post is in partnership with the Red Roof Inn. I moved to Chicago 20 years ago. I absolutely love everything about the city of Chicago. When you are in the city, you feel alive! The hustle and bustle is something that makes me happy! (I know not all people agree). I love exploring new restaurants, finding hidden gems, making memories and just taking in all the city has to offer. 12 years ago my husband and I moved to the suburbs. I agreed to moving to the suburbs as long as we still made it a point to head to the city as much as possible. I want our kids to love Chicago as much as I do. Christmas Break is one of the best times to visit the city. It is a great time to take in all the fun holiday events Chicago has to offer but it is also a nice break from being at home. A few days after Christmas the kids, my mother in law and I headed to the city for a much needed getaway. We wanted to be a tourist in Chicago! We first checked into the new St. Clair Hotel by Red Roof Inn. When I lived in the city I spent a lot of time in this area, brings back a lot of fun memories. It is just steps away from Michigan Avenue! You can park your car and walk everywhere you need to go! You can get to Water Tower, Garrett’s Popcorn, Navy Pier, Eataly, Dylan’s Candy Bar and much more in just a few minutes! We parked our car for $25 for over 24 hours using the spot hero app! Parking in Chicago can be expensive this is an great way to save money. We only had to walk a block from our parking garage to the St. Clair Hotel. The St. Clair hotel is the first in the Red Collection. It is an affordable hotel with upscale amenities. A few things I love about the St. Clair hotel is that it is dog friendly and it is one of the only hotels on the Mag mile that offers a 2 king beds in one hotel room! This is perfect for larger families. We also appreciated the sound machine and ear plugs. When you are use to the quiet of the suburbs this can come in handy while staying the night in the city. The location honestly is one of the bests that I have ever experienced in Chicago. If you have kids and need to go back to rest, feed or just take a break it is steps away from the Mag mile and makes it super easy! I already have plans to stay at the St. Clair Hotel in the summer. If you haven’t been to Chicago in the summer, you should put it on your bucket list! We had a nice lunch at Beatrix in Streeterville. It was only a 2 minute walk from the hotel. They have Brunch, Lunch and dinner. The kids wanted to hit up Water Tower for some shopping. They had receive gift cards for Christmas that were burning holes in their pockets! While we were their we discovered the Van Gogh For All exhibit. It is a traveling art exhibit that immerses you into the artwork of Van Gogh! It was a perfect opportunity to take some fun photos of the kids! After shopping we grabbed hot chocolates and coffee, took in the sights on our walk back to the Saint Clair Hotel. We checked in and went up to our room. I have stayed in a lot of different hotels in Chicago. We were very impressed with how clean our room was. It is newly renovated and that was very apparent. One of the things I loved the most was that their isn’t carpet in the hotel room but they had tile wood floors. This makes things feel clean and fresh. (you don’t see that often) We hung out in our room for a short bit before getting ready for dinner. We went to IL Porcellino my newest favorite Italian restaurant. The food was outstanding! It was only a 14 minute walk from our hotel. We were lucky because the temperature was 45 when we were visiting. It made walking bearable. I had heard about the Art at the Mart at the Merchandise Mart right before we headed to the city. I knew it was going to go on a break at the end of December until March. I wanted to make sure we checked it out. After dinner we took a quick cab over to Franklin and Wacker to view the incredible light show. (we could of walked but were feeling lazy by than.) The show was incredible! It you have the chance to view the light show this spring, I highly recommend it! We grabbed a cab and headed to Lincoln Park Zoo for the Zoo Lights. My kids had never been to the Zoo Lights and they really enjoyed. They especially enjoyed the light maze. The next day we woke up and had breakfast across the street from The Saint Clair hotel at Cooper Fox Gastropub. We headed to Dylan’s Candy Bar for some much needed sweets! Before we headed home we checked off one important thing off our bucket list! We went to the top of Willis Tower! This is something both of my kids have been dying to do. I have lived her for 20 years and have never done it! We only had to wait in a 20 minute line. It was definitely worth it. A memory all four of us will cherish. If you are looking for a fun and memorable trip to Chicago make sure you check out the St. Clair Hotel! You will not be disappointed! Disclosure: This is a sponsored post, all opinions are honest and my own.